The game is now officially titled Dragon Quest X: The Wake of the Five Tribes: Online. It's Dragon Quest, but the key here is that it's online. And it's got five tribes! The battle sequences for DQX will look familiar to anyone who's played DQ games, complete with pop-up menus for battle. Square Enix showed footage of the game via a streaming press conferences, so it's difficult to judge the game's visual impact, but I imagine that it looks as good as any Wii game can. Square Enix is also releasing a Wii U version with improved graphics, too. The Wii and Wii U launch makes sense, but probably pushes the game's release out to the Wii U launch (or maybe it's a launch title?). The game will also make use of 3DS functions, such as Tag Pass to change data. The Wii U is slated for a 2012 release, and there is currently no release date for Dragon Quest X. Square Enix asked fans to wait "just a bit more" for the title. "Maybe it will be out in 2012," Dragon Quest creator Yuji Horii said at the event. It doesn't seem like the Wii U version will be out in 2012, and apparently both versions will have some sort of subscription fees. Dragon Quest X Has a Subscription Fee? 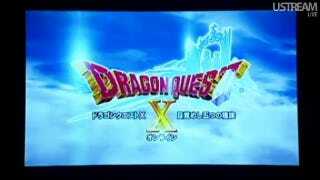 Dragon Quest X was originally revealed for the Wii back in 2008.